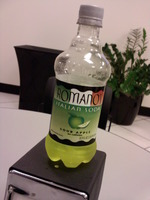 As you know my opinion on green apple flavored things isn’t a pleasant one.Fortunately Jones Soda Green Apple Soda helped me overcome that hatred, so I’ve decided to try other Green Apple flavored beverages.I hold in my hand a Romano’s Sour Apple beverage.I’m assuming (yes I know what assuming does) that Sour Apple, is just another way of saying Green Apple... since the green apple’s are the one’s that are sour.The color also tells me that this is a green apple based drink, so hopefully that phrase on assuming doesn’t come true. Here we go.First off I’d like to comment on how much I like the neon green color of this beverage.The smell coming out of this bottle is very much like Jolly Rancher Green Apple.I’m looking forward to this taste now, knowing that green apple flavor is abounds.Time to drink.WOW... this is some powerful stuff.Sadly, because of my previous assumption, ‘u’ and ‘me’ have both been made into asses.This is the sourest beverage I’ve ever had.It’s not “Warhead” sour, but it’s very sour when compared to other beverages.This is completely different then the Jones Soda, the amount of fizz is way higher in the Romano’s.Once it hits the back of my throat it burns... almost too much.I know in one of my recent reviews complained about not enough carbonation, and bite... but this one needs to tone it down a bit.Let me make sure you understand me.This beverage has a good taste, but the amount of sour, and fizz take away from it.As odd as it might sound though, I’m looking forward to more Romano’s beverages because of this experience.Now I know that Romano’s doesn’t mess around when it comes to flavoring, and mouth feel.So even though this might not get the best rating, know that I’m not normally a fan of green apple flavored things (as previously stated), and that I think those who truly like Sour Apple candy will love this beverage. It was so different I forgot to snap a pic before I started drinking.